Google’s tribute to Ada Lovelace, first computer programmer. Technology is supposed to make our lives easier, and it does, mostly. I’m sure I’m not alone in my struggle to learn the nearly constant changes in technology I’m supposed to apply in both my work as a teacher and also my work as a writer. I must admit part of the problem is I’m reluctant, not because it intimidates me though sometimes it does, but also because I’m tired of change. Society lacks a human connection and a connection to the natural world these days, and technology is making that lack more pronounced. I resist the indoor/sedentary lifestyle that has been imposed on me to become and remain connected to the world through technology. The paradox of this dilemma is that through technology I am more connected to people and places far away from me than I ever could have imagined 20 years ago, but that connection comes at a cost of being disconnected to physical reality. Technology is more than ever a matter of the mind in much the same way writing is. More of my life than ever is spent at a desk or sitting with a laptop warming my thighs as I grade papers, write blog posts (though I’ve done precious little of that lately) or work on my novel. Seldom do I drop everything and walk outdoors to enjoy the brilliant colors of autumn or call a friend or better yet, meet a friend for a walk amongst the brilliant colors of autumn or for coffee outdoors. This school year I’ve tried to balance the demands of a demanding job, to satisfy my creative calling, and to learn the technology skills I need to use to do both well, but I also don’t want to neglect the part of me that requires the sun on my face and the feel of stretching my legs on a long walk. More on that in another post. Who I would like to pay tribute to here is a woman for whom creativity and poetry was mathematical–seems a contradiction of terms to me because I’m language oriented, but I understand the elegance of math, just not the mechanics of it. I wish I did. I know I would have a far greater appreciation of the world and the workings of minds like Alan Turing’s, the man credited with breaking the Enigma code, or Ada Lovelace’s, the first computer programmer. Ada Lovelace was the only legitimate child of the Romantic poet, George, Lord Byron, and his wife, Anne Isabella Noel. Theirs was a stormy relationship and one that inspired Ada’s mother to foster in her a love of logic and math to prevent her from developing what Anne Isabella Noel regarded as the insanity (read poetry here) Ada’s father suffered. Despite her mother’s influence, Ada was fascinated with her father even though he left her mother and her when she was only a month old and died in Greece when she was only eight years old. Perhaps the influence of his reputation as a passionate, free thinking poet rubbed off on her after all or was handed down in her DNA. Whatever the reason, Ada became a mathematician who approached her subject using, to quote her, “poetical science.” She described herself as an Analyst and a Metaphysician.” I believe she had the same free-thinking tendencies, the creative vision, if you will, her father had and was able to make connections no one else had done because of those tendencies. Her mathematical talents led her to begin a working relationship and friendship with the brilliant British mathematician Charles Babbage, working in particular with him on his Analytical Engine. Babbage called her his “enchantress of numbers.” After she translated an article about the engine written by an Italian military engineer, Luigi Menebrea, Lovelace added her own extensive notes that she called simply Notes. The significance of Notes is that many consider it to contain the first computer program, (and here’s where the description of it escapes me) an algorithm that was to be carried out by a machine. Ada Lovelace’s remarkable accomplishment took place in the 1840s. Over 150 years later I struggle to understand basic computer coding to deal with my blogging program or my interactions on the web for my technological teaching needs, but I appreciate the intelligence that went into making those technologies possible. Her research and Notes along with Babbage’s work on the actual hardware paved the way for the work of Alan Turing and others of the Bletchly Park mathematicians who broke the code of the Enigma machine. Their successful breaking of the code is credited with saving Britain and, very possibly, the world from Nazi Germany and Japan. If you extend that credit, we would have to also thank Lovelace’s mother and Lord Byron’s the scoundrel ways for inspiring Lovelace’s mother to raise her to become a clear-eyed, logical but creative thinker! Tomorrow is Ada Lovelace Day, a day celebrated world-wide to honor the contributions of women in science, technology, engineering, and math. 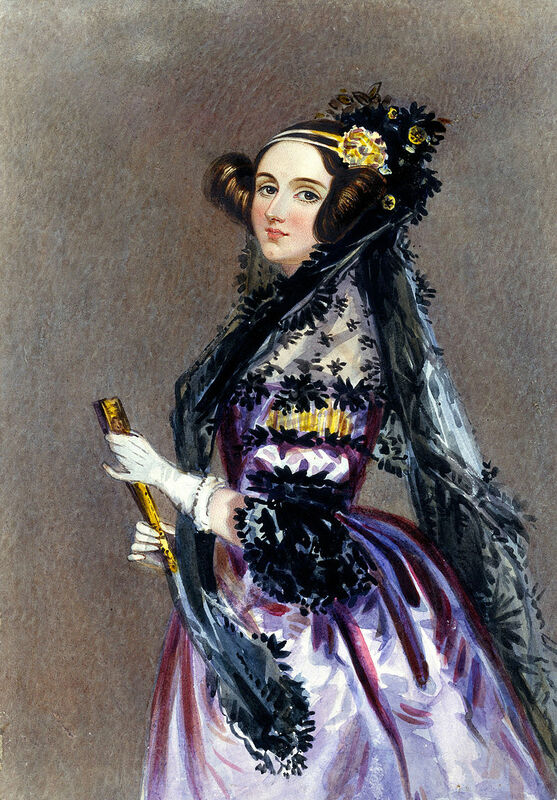 My hat goes off to the women like Ada Lovelace who have made our world what it is and have made technology to ease our handling of information. I just wish I were better able to understand the complexities of how it all works. I also wish there were a way to handle the new tasks created by technology. Wait, no I don’t. I love my world of language and the images and emotions it conjures. I’ll leave it to those women (and men) who make it possible for me to reach out to the world with my words. Tomorrow, October 13, I’ll raise a glass to the women who have made this blog possible through technology! Here’s to you Ada Lovelace and your poetical science!